An easy hike up a good paved/gravel road on private ranch lands, less than half a mile from Cummings Skyway where I parked. The top is crowned by several cell and microwave towers which I walked around. The summit was bulldozed for the towers, leaving nothing higher inside to make it worth trying to breach the fence. I found a reference mark outside the fence but no sign of the benchmark inside, where the reference mark was pointing. The views overlooking the Carquinez Straight to the east would be nice if the sun wasn't washing everything out at the moment. I originally thought this was a ranked (more than 300ft of prominence) summit, but later found it comes up short by about 50ft. 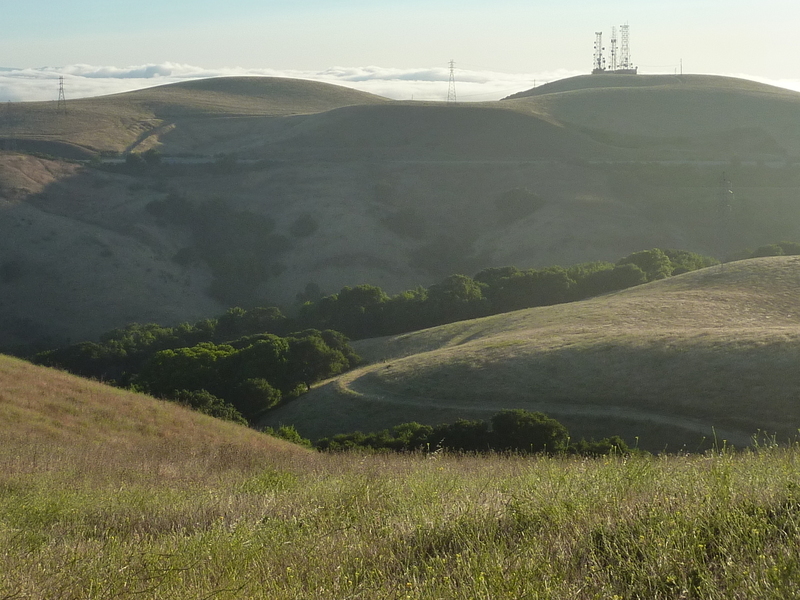 The land is part of the EBRPD land bank, not open to the public. Cummings Skyway was again the starting point, just a short distance SE of the previous starting point. The easy hike follows along ranch roads with a short cross-country stint at the end through tall, brown grass. Another short hike on private ranch property. The key is a gap in the road maintenance yard fence that leads to the unused ranch road behind it. A sign warns of video surveillance, but as with most of these I've seen over the years, there was no camera in sight - a little black plastic box nailed to a tree would make it more believable. The road going up is quite steep. At a property boundary I went over a gate and then cross-country up to the summit (with another ranch road running over it). This one was much more protected from observation than the previous two hikes for which I was more nervous. It was not by chance that I picked these three to do first while it was still early. This one is mostly on public trails. The Muir Land Trust bought three ranches in the upper half of the route that are accessible through a multi-use trail starting off Dutra Rd. Kims Horse Training is right next door and it is obvious that the horses are the main users of the trail system. The GPX track I got off PB along with the descriptions were helpful in navigating the various branches in the trails. Near the top, I followed a feeder trail to the boundary of the Land Trust property, going through an unsigned, unlocked gate to a residential area found around the highpoint. I did as others did, skirting the edge of one property (still under construction, it seems) to find my way to the flattish highpoint with decent views. This was the longest of the day, about 2.5mi each way. Another short hike, this one starting from the edge of a Martinez residential neighborhood, climbing up a small, undeveloped hill on private property. This one, too, has little chance of discovery, but my luck looked like it had run out. Just as I was approaching the highpoint, a gentleman on horseback about a hundred yards away spied me at the same time I saw him. I decided to take my lumps and let him chew me out, so I soldiered on towards him (and the highpoint, of course). He then abuptly turned his horse around and went back the way he'd come. Maybe he didn't belong there either? Very strange. Located in Alameda County on private ranch property, the shortest route up is directly up from Norris Canyon Rd that runs below the south side. This has multiple occupied properties that made me look for a less-exposed route. I chose to start from the Thomas Ranch residential development about a mile and a half to the northeast. I started by walking through a kids' park and then into the rough grass and thistle ravine immediately behind it. I eventually climbed out to a ranch road which I followed for about a mile until below the summit on the east side. A straightforward cross-country climb up grassy slopes got me to the summit. There is some chance of being detected on this route with a home on either side at some distance, but much less than the Norris Canyon Rd approach. I've regularly said I have low standards. It takes some folks awhile to realize just how low they are.